WLU Junk-Line – who wow crowds with garbage-can drumline music – is just one of many student groups at Laurier. Laurier’s innovative programs and academic excellence are the reason you’re here. We get that. But this is your life, too – and if you’re going to get the full Laurier experience, you’ve got to make this place your own. Don’t just sit there and study. Join a club. Apply to co-op. Volunteer. 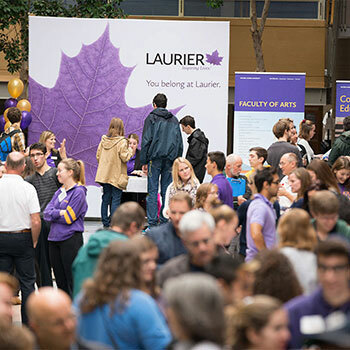 There are tonnes of different ways you can get involved in university life at Laurier – we’re sure you’ll find one (or two, or three!) that will be perfect for you. The moment you step foot onto one of our campuses, you’ll know you are home. Our students have built an amazing community and we’ve saved you a spot in it. Explore our campuses and learn what you can do in the cities of Waterloo and Brantford. Experiential learning takes many shapes and forms, and at Laurier you can add experience to your resumé through our Laurier Experience Record. It’s the things you’re involved in outside of the classroom that set you apart for employers. We have the largest business degree co-op program in Canada and it was the first one to be offered in Ontario. More than two-thirds of our programs are eligible for co-op and experiential learning opportunities are available in all programs. Laurier has one of Canada’s most active student unions with more than 250 student-led clubs and associations and 5,000 members. The opportunities to find your fit are endless. Participate in one of our Residence Councils and create an amazing first-year experience for everyone living in residence with you. Plan events and meet new people along the way. and intercultural skills, around the world and right at home. Study abroad, learn a new language, celebrate culture and more. Last year, more than 8,000 students participated in our award-winning intramural programs, and our 13 varsity teams are a huge part of campus life. Homecoming is a time-honoured tradition in higher education, but no one does it quite like us! Our school spirit is infectious and it won’t take long before you’re singing “It’s great to be a Laurier Golden Hawk” at the top of your lungs. No matter which academic program you choose, you can immerse yourself in the world of entrepreneurship at Laurier. Bring your ideas to life through our LaunchPad program, where Canada’s next generation of successful entrepreneurs are making waves. There’s a place for you here in our fulfilling, safe and successful community. From academic support to health and wellness, our student services will help propel your personal, academic and professional ambitions. Meet up with a group, or work on your own with an abundance of study spaces to choose from. Looking to take a study break with your friends? There are many places on- and off-campus to spend time connecting with new friends in a relaxed setting at both of our campuses. Open mic nights at Wilf's Pub, cultural activities at the Laurier Library... there's always something going on at Laurier. Come out to one of the many Students’ Union events. Created by students for students, some of the events hosted last year included The Amazing Race and Winter Carnival. Laurier's Sustainability Office is committed to environmental awareness and action on campus and beyond. We integrate sustainability programming into all facets of your campus life, including classes, residence, transportation, food and more! No matter which of our campuses you tour, once you come you'll immediately feel this "community" we keep talking about.